The Synod of Bishops on ‘the New Evangelisation’ a few years ago said in their closing message to the People of God: ‘If people are going to see in us the face of Jesus Christ, then they have to see a Church that is reaching out to the poor, that is caring for the sick and the marginalised, that is providing for children the next step in their encounter with Jesus’. 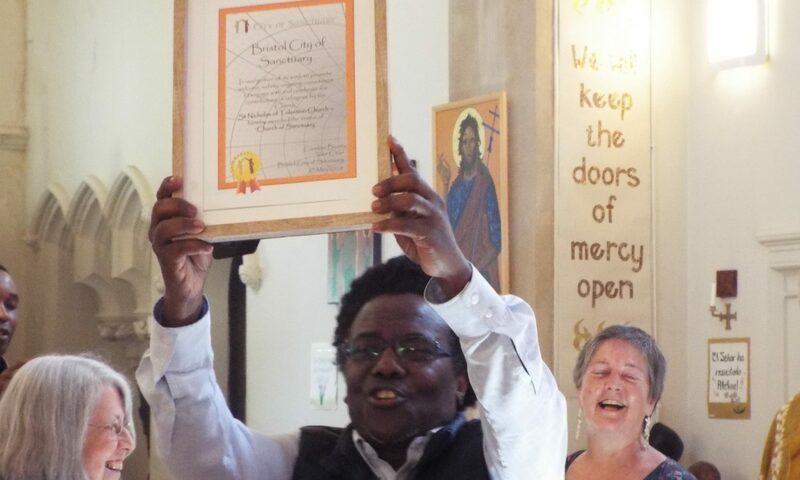 This is precisely the vision that animates St Nicks and its life and mission in Bristol’s inner city. As a parish, and as their priest, we and I take very seriously ‘God’s preferential option for the poor’, as taught by the Church’s Social Teaching. This teaching is enshrined in the Scriptures from the liberation of the Hebrew slaves from Egypt in Exodus (a story of abused refugees), through the Law of Sinai that was on the side of the poor and ‘the stranger among you’, and the Prophets who challenged the People of God to live justice rather than hide behind ritual and sacrifice, to the birth of the Saviour in the poverty of homeless Bethlehem, escaping as a refugee from Herod’s terror and growing up in the poverty and squalor of Nazareth. His great parable of the Last Judgement asks nothing about religious belief but about our compassionate and caring humanity (Matt 25). But this must never remain teaching – there is no ‘orthodoxy’ without ‘orthopraxis’ – living it in practice! The Church has always valued (even declaring them Saints!) those who practice such an option for the poor. Here are two stories from our faith Tradition. St Lawrence was a deacon of the Church in Rome in the third century. The pope and the other deacons had been martyred in the catacombs, but the Governor of Rome heard of the riches of the Church – chalices, vestments etc. So he instructed Lawrence to bring these riches to his residence within two days. In fact Lawrence had already sold them to give the money to the poor of Rome – with the now martyred Pope’s approval. So two days later he arrived at the doors of the Governor’s residence with a crowd of the impoverished and the beggars of Rome and presented them to the Governor with the words: ‘Here are the riches of the Church’! He was grilled alive that day! Our parish patron saint (who lived in Italy in the 13th and 14th centuries), St Nicholas of Tolentino as a young child was brought up by his parents to share their love and concern for the poor, going with them to the homes of poorest with food and clothes. When he was a young novice with the Augustinians, he would give the monastery’s food away to the poor. The community became angry and the Prior forbade him to do so. However, he knew a higher obedience and a more authentic voice, and continued to do so. One day the Prior intercepted him on his way from the kitchen to the monastery door, with a cloak full of bread for the poor. When challenged to reveal what he was carrying, he opened his cloak and it was filled with roses! The Prior recognised the sign from God, instructed St Nicholas to continue giving the food to the poor and instructed the community to support this work and not grumble. From that day, the community was never again hungry.